I hope you are well and happy and watering seeds of joy. This is a reminder that there will be a gathering this coming Sunday at 6 PM at the home of the West's. (directions below) There will be sitting and walking meditation, looking at Thay's teachings from the "Art of Living" and sharing the Dharma. Linda will be facilitating and it should be a delight. I hope you can be there. SANGHA PICNIC I also hope that you will SAVE THE DATE Saturday, October 6 when we will enjoy the annual RI Community of Mindfulness picnic at Colt State Park in Bristol. Shelter #3 at noon. Please bring a vegetarian dish, your family, your friends, your pets, a song, a poem, a game, an instrument....but most of all your joyful self. It is fun and a wonderful opportunity to meet folks from the other Sanghas that are part of our larger Community. I hope you will be able to join us. We received this request from Ann... "Please thank the sangha for their prayers and Metta. My mother has a doctors appointment this Thursday at which we may find out more about the appropriate level of care for her, whether hospice or continued home health. In any case she is more frail and in need of much more help than before her hospitalization and we are doing our best to take good care of her and family is coming in from different areas to visit. Prayers and Metta welcome!" Also if you would like to have a prayer request in the update please contact Tracey Buffum at 401 633 4214 and e-mail traceybuffum@gmail.com see below for details. Until we meet again, I hope that you see the basic goodness in yourself and everyone else. There are so many wonderful beings doing their best to make this world a better place. Breathe with unconditional breath the unconditioned air. Shun electric wire. Communicate slowly. Live a three-dimensional life; stay away from screens. Stay away from anything that obscures the place it is in. There are no unsacred places; there are only sacred places and desecrated places. I hope you are all well, happy, maintaining your equanimity and enjoying every breath. We also want to wish our Jewish friends a Happy New Year...L'Shana Tova! The Jewish New Year Celebration of Rosh Hashanah will begin on Monday. It is a time to pray and repent. All debts from the past year are supposed to be settled before Rosh Hashanah and many seek forgiveness from friends and family prior to this event. Some perform the tashlikh. They may recite prayers and cast bread crumbs in a stream or river, symbolically throwing one’s sins away. May we all make amends and begin anew! This is a reminder that we will be gathering at our home (725 Matunuck School House Rd ) tomorrow evening at 6:00. We will enjoy sitting and walking meditation, I will offer a talk and we will share the Dharma. I hope you will all be able to be with us. PRAYER REQUEST Please continue to hold Laura French in your prayers...you can visit or send love in the form of a note to her at 179 fairway Drive, North Kingstown RI 02852. I have also included the ways you can access help through our Caring Committee. At our last meeting we talked about Beginning Anew and letting go of resentments. Here is a truly inspiring story of a woman's transformation and literal change of heart. Facing impermanence, particularly our own, has a way of helping us get clarity! As the Dalai Lama says, "Everyone suffers, how can we be anything but kind?" And in these increasingly challenging times in which we live, we can choose to be incpired by these young people who are respnding to a major trauma by being in love....and doing everything they can to set up safeguards to see to it that what happened to them won't happen to anyone else. Autumn is coming, let's make this a season of love! Enjoy! I hope you are able to be with us tomorrow...until then, enjoy this evening which has the fragrance and feeling of autumn. Please cut and save the following for future quick reference or you might like to take a photo for your phone. Then please put it to good use! Here are the ways to access the different Sangha resources. Requests for Help: Point Person is Tracey Buffum - 401 633 4214 and e-mail traceybuffum@gmail.com. This includes requests for meal support, household or transportation requests, etc. can be sent to Tracey and she will get them to the proper person. Prayer Requests: Point Person - Tracey Buffum - 401 633 4214 and e-mail traceybuffum@gmail.com. Please write exactly what you would like to be shared, and where friends can send notes or cards. Do you prefer email or snail mail? In either case, please include contact information you would like them to use. If you would like your prayer request to be sent out as part of the Sangha Update, please send the information to Tracey. You may also feel free to post prayer requests to the google group yourself. Hard Copy Directory: Point Person - Linda Lamont lslamont@gmail.com If you choose to be listed in this directory, names, numbers, emails and addresses will be available to all, Google Group: Point Person - Cindy West - westnest5@verizon.net group email to help stay connected to events/activities/requests for ride sharing, etc. We encourage you to post any happenings that seem pertinent to our Sangha or if you would like to offer a social event. In subject line, please mention what sort of activity it is, ie., Social action opportunity, carpooling, or social event, etc. 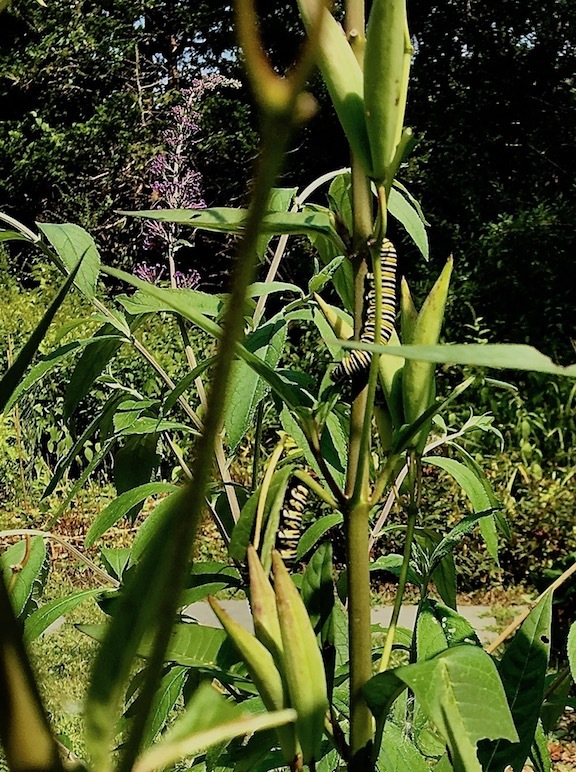 Caterpillars -Monarch Butterflies to be! Miracles abound! I hope you are all well and taking delight in this glorious day! This is a reminder that we will be gathering at the Unitarian Universalist Congregation of South County on North Rd. in Peace Dale at 6 PM tomorrow evening. We will enjoy a sitting meditation, we will share the Dharma and recite the Five Mindfulness Trainings. Clare will be facilitating. We have been using the book "Creating True Peace" for the ground of our sharing and we will be finishing that with a review. At our first Sunday gathering in October we will begin to use the Fourteen Trainings as the ground of our sharing. I have included a copy of them in this update.They are wonderful guidelines for practice. I hope you will be able to be with us tomorrow evening. GOOD NEWS! The Generations Sangha will start up again on the second Saturday of October at our new home in the Friends Meeting House in Providence from 10-11:30. I will keep you posted with the details. It is so good to learn the mindfulness practices when we are young. If you have children or know folks who do, or just like children, please come and join us and let others know that it is happening. I hope we can be together soon, and in the meantime, let's take delight in impermanence and see the butterflies in the caterpillars! Sharing a beautiful Path makes life a joy! I hope you are all well, free and happy. This is a reminder that we will be gathering at our home (725 Matunuck School House Rd) tomorrow evening at 6:00 PM. We will enjoy sitting/walking (in the garden, weather permitting) and sitting meditation. I will offer some of the practices that Thay has offered us for navigating challenging waters and we will share the Dharma. I hope you will be able to be with us. Clare has sent the following...as it is time to choose a new book for the sharing at the first of the month meeting......please contact her with suggestions. "The first of the month sangha is completing Thich Nhat Hanh’s book, Creating True Peace. We will have a summation of the book and helpful practices at the first of the month meeting in September. Please send an email to Clare at clare2sartori@gmail.com if you have any thoughts of a new book for us to explore. We prefer work by a Thich Nhat Hanh." With all of the lying, cheating, etc. that we hear about...it is easy to start to think that the world is a very dark place...so....I like to remind myself of the basic goodness of human beings... I do believe goodness is far more plentiful...here is a wonderful example. This elementary school replaced detention with meditation. I hope we can be together soon, and in the meantime, let's be kind! Requests for Help: Point Person is Tracey Buffum - 401 633 4214 and e-mail traceybuffum@gmail.com. This includes requests for meal support, household or transportation requests, etc. can be sent to Tracey and she will get them to the proper person. Prayer Requests: Point Person - Tracey Buffum - 401 633 4214 and e-mail traceybuffum@gmail.com. Please write exactly what you would like to be shared, and where friends can send notes or cards. Do you prefer email or snail mail? In either case, please include contact information you would like them to use. If you would like your prayer request to be sent out as part of the Sangha Update, please send the information to Tracey. You may also feel free to post prayer requests to the google group yourself. Hard Copy Directory - Point Person - Linda Lamont lslamont@gmail.com If you choose to be listed in this directory, names, numbers, emails and addresses will be available to all, Google Group - Point Person - Cindy West - westnest5@verizon.net group email to help stay connected to events/activities/requests for ride sharing, etc. We encourage you to post any happenings that seem pertinent to our Sangha or if you would like to offer a social event. In subject line, please mention what sort of activity it is, ie., Social action opportunity, carpooling, or social event, etc. I hope you are all well and cultivating compassion for yourself and everyone else. This is a reminder that we will be gathering at our home (725 Matunuck School House Rd) tomorrow evening at 6:00 PM. We will enjoy sitting/walking (in the garden, weather permitting) and sitting meditation. I will offer a talk and we will share the Dharma. I hope you will be able to be with us. I would also ask that you continue to hold Richard and me in your hearts. We spent time this past week at Sloan Kettering and found out that the protocol I have been on since April is not doing the trick. I will be starting a new chemo on Monday so please send good thoughts. I also apologize that some health issues have been taking up lots of my time, so if I have not been responsive, please resend emails or make another call. Thank you, thank you. In my lifetime I have experienced hatred and love....it is clear to me that if I want to be happy and free I choose love.... or as Dr. King said, "I have decided to stick with love. Hate is too great a burden to bear." With all of the lying, cheating, etc. that we hear about...it is easy to start to think that the world is a very dark place...so....I like to remind myself of the basic goodness of human beings... I do believe goodness is far more plentiful...here is a wonderful example. and, of course, water lots of seeds of joy..
Requests for Help: Point Person is Tracey Buffum - 401 633 4214 and e-mail traceybuffum@gmail.com. This includes requests for meal support, household or transportation requests, etc. can be sent to Tracey and she will get them to the proper person. Prayer Requests - Point Person - Tracey Buffum - 401 633 4214 and e-mail traceybuffum@gmail.com. Please write exactly what you would like to be shared, and where friends can send notes or cards. Do you prefer email or snail mail? In either case, please include contact information you would like them to use. If you would like your prayer request to be sent out as part of the Sangha Update, please send the information to Tracey. You may also feel free to post prayer requests to the google group yourself. Hard Copy Directory - Point Person - Linda Lamont lslamont@gmail.com If you choose to be listed in this directory, names, numbers, emails and addresses will be available to all, Google Group - Point Person - Cindy West - westnest5@verizon.net group email to help stay connected to events/activities/requests for ride sharing, etc. We encourage you to post any happenings that seem pertinent to our Sangha or if you would like to offer a social event. In subject line, please mention what sort of activity it is, ie., Social action opportunity, carpooling, or social event, etc. May I be peaceful, happy, and light in body and spirit. May she be peaceful, happy, and light in body and spirit. May he be peaceful, happy, and light in body and spirit. May they be peaceful, happy, and light in body and spirit. May I be safe and free from injury. May she be safe and free from injury. May he be safe and free from injury. May they be safe and free from injury. May I be free from anger, afflictions, fear, and anxiety. May she be free from anger, afflictions, fear, and anxiety. May he be free from anger, afflictions, fear, and anxiety. May they be free from anger, afflictions, fear, and anxiety. May I learn to look at myself with the eyes of understanding and love. May I learn to look at her with the eyes of understanding and love. May I learn to look at him with the eyes of understanding and love. May I learn to look at them with the eyes of understanding and love. May I be able to recognize and touch the seeds of joy and happiness in myself. May I be able to recognize and touch the seeds of joy and happiness in her. May I be able to recognize and touch the seeds of joy and happiness in him. May I be able to recognize and touch the seeds of joy and happiness in them. May I learn to identify and see the sources of anger, craving, and delusion in myself. May I learn to identify and see the sources of anger, craving, and delusion in her. May I learn to identify and see the sources of anger, craving, and delusion in him. May I learn to identify and see the sources of anger, craving, and delusion in them. May I know how to nourish the seeds of joy in myself every day. May I know how to nourish the seeds of joy in her every day. May I know how to nourish the seeds of joy in him every day. May I know how to nourish the seeds of joy in them every day. May I be able to live fresh, solid, and free. May she be able to live fresh, solid, and free. May he be able to live fresh, solid, and free. May they be able to live fresh, solid, and free. May I be free from attachment and aversion, but not be indifferent. May she be free from attachment and aversion, but not be indifferent. May he be free from attachment and aversion, but not be indifferent. May they be free from attachment and aversion, but not be indifferent. I hope you are well, acting from a place of beauty and dancing in the rain! This is a reminder that we will be gathering tomorrow evening at the home of Cindy and John West at 6 PM. (directions below) We will enjoy a sitting meditation, continue to study Thay's teachings from "The Miracle of Mindfulness", and share the Dharma. I hope you will be able to be with us. The Sangha Caring Committee has been organizing ways that as a community we can stay better connected and help one another. A deep bow of gratitude to them. I am including a letter that summarizes their work so far and a post card with all of the important contact information that you will need for requesting help, prayer requests, getting included in the sangha directory and our google group.Please save it as a hard copy or a photo on your phone for future reference. And also please feel free to request prayers and help....that's what a Sangha is for! I am particularly grateful for the help that you all are offering. Thank you, thank you. Please continue to hold Laura French in your prayers...you can visit or send love in the form of a note to her at 179 fairway Drive, North Kingstown RI 02852. SANGHA PICNIC I also hope that you will SAVE THE DATE Saturday, October 6 when we will enjoy the annual RI Community of Mindfulness picnic at Colt State Park in Bristol. Site #3 at noon. Please bring a vegetarian dish, your family, your friends, your pets, a song, a poem, a game, an instrument....but most of all your joyful self. It is fun and a wonderful opportunity to meet folks from the other Sanghas that are part of our larger Community. I hope you will be able to join us. In these challenging times when courage seems to be at a premium.... I feel that it is important for me to seek out inspiring people...here is a remarkable one...be inspired! MyJewishLearning.com - Facebook https://www.facebook.com/MyJewishLearning/videos/chiune.../2219688364724310/ This Japanese diplomat risked his life to help thousands of Jews flee Europe during the Holocaust. CARING COMMITTEE Dear Sangha, On June 25th, the Caring Committee met and discussed different ways in which we can help support to the Clear Heart Sangha. Tracey Buffum, Dori Gerhardt, Ed Dettman and Cindy West offered to be the point persons for requests for help. To facilitate things, it was decided that requests for support/help be emailed to Tracey Buffum (traceybuffum@gmail.com), who will then pass the info onto the others. We will then do our best to do what we are able, either amongst ourselves, or by sending it out to the broader Caretaking committee , and then the larger sangha. Our intention is to offer, when needed, meal support, household or transportation requests, and the like, as well as requests for metta. In the case of metta, we ask that you please email us what you would like for us to share, so that we do not send out misinformation, or info which is not accurate. Please include what you would like us to share and how you would like to receive well wishes - either email or snail mail and include that contact information. We will then post it to the google group, as well as sending it to Joanne to post on the Clear Heart Sangha email. We are also creating a hard copy directory for members to communicate with each other. If you choose to be on this directory, names, numbers, emails and addresses will be available to all, and will be distributed as an email attachment or a paper copy. We will do our best to update this directory once or twice a year. Another item discussed was our desire for more sangha building activities. If you are inclined, we welcome any/all to offer a gathering of your choice. Pot lucks, movies, walks, book discussions were all suggested. Putting a limit on the number of persons attending is fine, and can be more accommodating for those with smaller spaces to share/offer. Ideally, it would be wonderful to offer 3-4 activities each year, in addition to our regular Sunday gatherings. Active involvement in any activity often fosters a greater depth of practice. We encourage members to offer their support by inviting the bell, or help to facilitate a meeting. Both of these things are a gift that we can offer, and it allows those who frequently do so, some space to enjoy each aspect of our gathering. There is plenty information available to help make it both fruitful and comfortable to participate! As has been our habit, we welcome any to sign up for the Google group email to help stay connected to events/activities. We encourage you to post any happenings that seem pertinent to our Sangha. Easiest, perhaps, if in the subject line, it is mentioned what sort of activity that it is, ie., Social action opportunity, carpooling, or social event, etc. Many thanks to all who participated in the meeting, offering their time, care and support. We are very fortunate to have such a wonderful practice where we do our best to help one another! Requests for Help: Point Person is Tracey Buffum - 401 633 4214 and e-mail traceybuffum@gmail.com. This includes requests for meal support, household or transportation requests, etc. can be sent to Tracey and she will get them to the proper person. Prayer Requests Point Person - Tracey Buffum - 401 633 4214 and e-mail traceybuffum@gmail.com. Please write exactly what you would like to be shared, and where friends can send notes or cards. Do you prefer email or snail mail? In either case, please include contact information you would like them to use. If you would like your prayer request to be sent out as part of the Sangha Update, please send the information to Tracey. You may also feel free to post prayer requests to the google group yourself. Google Group - Point Person - Cindy West - westnest5@verizon.net group email to help stay connected to events/activities/requests for ride sharing, etc. We encourage you to post any happenings that seem pertinent to our Sangha or if you would like to offer a social event. In subject line, please mention what sort of activity it is, ie., Social action opportunity, carpooling, or social event, etc. “I said to my children, 'I'm going to work and do everything that I can do to see that you get a good education. I don't ever want you to forget that there are millions of God's children who will not and cannot get a good education, and I don't want you feeling that you are better than they are. For you will never be what you ought to be until they are what they ought to be― Martin Luther King Jr. I hope you are well and realizing your potential during these sultry summer days. This is a reminder that we will be gathering tomorrow evening at the Unitarian Universalist Congregation of South County at the Lily Pads complex on North Rd. in Peace Dale at 6 PM. We will enjoy a sitting meditation, continue to study Thay's teachings on "Creating Peace", recite the Five Mindfulness Trainings and share the Dharma. I hope you will be able to be with us. The Sangha Caring Committee has been organizing ways that as a community we can stay better connected and help one another. A deep bow of gratitude to them. I am including a letter that summarizes their work so far and a post card with all of the important contact information that you will need for requesting help, prayer requests, getting included in the sangha directory and our google group.Please save it as a hard copy or a photo on your phone for future reference. I have been experiencing a bit of a rocky road with my treatments, so I am particularly grateful for the help that you all are offering. Thank you, thank you. SANGHA PICNIC I also hope that you will SAVE THE DATE Saturday, October 6 when we will enjoy the annual RI Community of Mindfulness picnic at Colt State Park in Bristol. Please bring a vegetarian dish, your family, your friends, your pets, a song, a poem, a game, an instrument....but most of all your joyful self. It is fun and a wonderful opportunity to meet folks from the other Sanghas that are part of our larger Community. I hope you will be able to join us. In these challenging times I feel that it is important for me to seek out inspiring people...here is a remarkable one...be inspired! As has been our habit, we welcome any to sign up for the Google group email to help stay connected to events/activities. We encourage you to post any happenings that seem pertinent to our Sangha. Easiest, perhaps, if in the subject line, it is mentioned what sort of activity that it is, ie., Social action opportunity, carpooling, or social event, etc. Clouds come, clouds go, but the mind is a clear blue sky. I hope you are enjoying these midsummer's days - relaxing and able to meet everything calmly. I was just writing to remind you that tomorrow is the 5th Sunday of the month and we don't hold Sangha meetings on the fifth Sundays. Our next gathering will be next Sunday, August 5 at 6:00 at the Unitarian Universalist Congregation of South County, in the Lily Pads complex on North Road in Peace Dale. I hope you will be able to join us then. Also, some members are compiling a directory of contact information for those of you who would like be included. Please send your name, address, email and phone number to Linda Lamont at lslamont@gmail.com, who along with Adria is being kind enough to compile this for us. Please be aware that everyone who signs up for the directory will be sharing their contact info with everyone else in the directory. I also hope the you will SAVE THE DATE Saturday, October 6 when we will enjoy the annual RI Community of Mindfulness picnic at Colt State Park in Bristol. Please bring a vegetarian dish, your family, your friends, your pets, a song, a poem, a game, an instrument....but most of all your joyful self. It is fun and a wonderful opportunity to meet folks from the other Sanghas that are part of our larger Community. I hope you will be able to join us. Until we meet again, I hope you will be enjoying every minute. Here is a "how to" video. How to keep cool and enjoy every moment! Enjoy! “In life, we plant seeds everywhere we go. Some fall on fertile ground needing very little to grow. Some fall on rocky soil requiring a tad bit more loving care. While others fall in seemingly barren land and no matter what you do; it appears the seed is dead. I hope this finds you all well and happy, enjoying this beautiful summertime and planting seeds of kindness, love and peace. We will be strengthening those seeds in ourselves this coming Sunday at 6PM when we meet at our home at 725 Matunuck School House Rd. Wakefield. We will enjoy sitting/walking (in the garden, weather permitting) /sitting, I will offer a talk based on some of the teachings from the 21 day Plum Village Retreat and we will share the Dharma. I hope you will be able to be with us. and...as always ...we need to water lots of seeds of joy....here is a beautiful illustration of mindfulness and concentration....balancing stones...enjoy! We are contacting you as you expressed interest in a Sangha (meditation group) in Newport. We may have received your contact information at the screening of the film, "Walk With Me" in Newport last fall or you may have spoken with one of us individually. We are happy to let you know that the first meeting of the Peaceful Waters Sangha will be held on Monday, July 9th from 6:30-8:30pmat St Paul's Methodist Church, 12 Marlborough St. in Newport, RI. Our current schedule is to meet on the 2nd and 4th Mondays. We practice in the tradition of Zen Master, Thich Nhat Hanh. We will have sitting and walking meditation, a book study and time for Dharma sharing. Once a month, we will read The Five Mindfulness Trainings. If Joanne Friday, our Dharma teacher, is able to join us, she will give a talk. If you are interested in helping us, please respond to this e-mail. We may need assistance in greeting, setting up and breaking down the room. There will be many opportunities to participate in and co-create the Peaceful Waters Sangha. As for logistics: Please use the side door on the right when looking at the front of the church. There are 2 parking lots accessible from Marlborough St. and all spaces are available unless they have a cone in them, or are marked 24/7. If they have a name on them it's ok to park there UNLESS there is a cone or 24/7. There is also a back lot accessible from Charles St. on the side. Look for the signs that say Peaceful Waters Sangha. Upon entering the building from the side door on the right from the front of the building, you will go straight down the hallway through the kitchen, take a left and the door is immediately on the right. It is easy to find. We hope you are all well and enjoying the summer! We look forward to practicing with you. Dear Friends, I hope you are all well and keeping cool during these beautiful and warm July days. I also hope that you are doing much better than my computer! This is simply a reminder that we will be gathering at the West home tomorrow evening at 6 PM. (directions below) We will enjoy a sitting/walking/sitting meditation, continue looking at Thay's teachings from the Miracle of Mindfulness and share the Dharma. I hope you will be able to attend. I also hope that in the meantime you will be enjoying every moment. DIRECTIONS TO THE WEST HOME We live about 2 miles from URI. From rt 138, go north onto Old North Rd. (across the street from big sign ““Kingston Hill Store Books Used and Rare””. Also, just a smidge west of the 138/108 traffic light). Old North Rd starts off as a one way, continues on as a two way street, and finally ends as a T. You will see our corner property from there. Go left at the T (Old North Rd meets Stoneyfort Rd), and then a quick right onto Plantation Dr. We are the first home on the right (2nd driveway is easiest). Come on in the side door (porch/kitchen)! What is so sweet as a Summer Sunset at the Seashore....ahhhhhhhhhhh! I hope you are all well and enjoying this beautiful day and the wonderful light shows provided by the miraculous turnings of this planet. I am writing to let you know that Cindy was kind enough to change Sundays with us.... as we will be unable to host the third Sunday. So tomorrow we will gather at our home which is at 725 Matunuck School House Rd. Wakefield. We will enjoy sitting/walking (outdoors weather permitting)/ sitting meditation, I will offer a talk and we will share the Dharma.. I hope you will be able to join us. It is wonderful to be able to sit in silence and be together in these topsy-turvy times. Please also hold the 12 boys trapped in a cave in Thailand in your prayers so that they might be safely reunited with their families. I would also ask for continued prayers as I begin another round of chemo at a stronger dose. Please continue to hold all of the children that our government has separated from their families along with their parents in your prayers and in your hearts. The Governor of Washington said that the governors were told on a conference call yesterday that the government now says that reuniting them could be with parents, family members or an American foster family. This shows a stunning lack of awareness of the bond that exists between a parent and child. You might also like to contact our friends in Washington to let them know your views on this. All of them have contact information at usa.gov/elected-officials. Remember there is a new Sangha starting up n Newport on Monday evening at 6:30. All the information is below. This will be a wonderful thing for Aquidneck Island! WISDOM, SKILLFUL MEANS AND DELIGHT To water our seeds of joy! https://www.facebook.com/WellRoundedLifebyattn/ or just google....How Mr. Rogers found subtle ways to fight racism. To be inspired...you might like to listen to Mr. Rogers 2002 Commencement Speech at Dartmouth College. You can find an edited version on my Facebook Page...or simply google the title emboldened above for the entire speech. enjoy! I hope that we get to practice together very soon and in the meantime, I hope that you are remembering to stop and breathe, to get some clarity and do what you can to help, and, of course water lots of seeds of joy to expand your capacity to be with what is! I hope you are all well and enjoying these sultry summer days. This is just a reminder that we will be gathering tomorrow evening at the Unitarian Universalist Congregation of South County in Peace Dale at 6 PM. We will enjoy a sitting meditation, continue to share Thay's teachings from "Creating True Peace", and share the Dharma. I hope you will be able to be with us. There are so many ways we can be of help. If you would like to keep up with some opportunities with prayer requests and for engaged practice, sign up for our google group. It is overseen by Cindy and you can contact her at westnest5@verizon.net. There is also a new Sangha forming in Newport. The first gathering will be on July 9 at 6:30 at St. Paul's Methodist Church. This is a wonderful opportunity for those on the other side of the bay! And to water some more seeds of joy....copy and paste the title below into youtube. Enjoy! Despacito, sube me la radio, ballad. I hope this finds you all well and enjoying this beautiful summertime. It is so easy to water our seeds of joy in the summertime....and tomorrow we will have an opportunity to deepen our practice and water each others' seeds of joy. If you are so moved, please bring something uplifting to share. It could be a gratitude, a short poem, a song, a recounting of an experience that brings you joy. Normally this meeting would be at the home of the Van Horn's, but they are unable to host, so we will gather at our home at 725 Matunuck School House Rd, Wakefield. We will enjoy sitting/walking/sitting meditation, I will offer a brief talk and we will share our joy. We are living in very challenging times. Fortunately, it is so easy to water our seeds of joy and expand our capacity to be with all we are called upon to be with. I know that several of you are dealing with ailing family members, with a death of a loved one, with illness, etc. along with what is happening in our country. In the midst of it all we need to nourish and take good care of the highest and best in ourselves so we can be of some help to those who are in need. At our last meeting the focus was on ways to maintain our integrity, our balance and stay connected with our true nature and basic goodness. In the times in which we are living this can be a challenge. One way we have of doing that is to let go of the excess baggage that we have been dragging around with us that leads us to self judgement and criticism. It is time to let go of outdated ideas and views and lighten our load so that we can love ourselves and each other more. I shared the prayer for forgiveness which several of you requested that I send to this list...so I have included it below. There is a "Team Laura” set up to care for her in her home, as she is very challenged by her health. She now has nurses visiting on Mondays, Wednesdays and Fridays. We’re hoping she’ll agree to a program in Wakefield for Tuesday and Thursday, but right now she’s adjusting to a new routine, with people coming and going, checking on her and helping her with food shopping and such. This is a tender time for her, so please send metta. And a card if you are so inclined... 179 fairway Drive, North Kingstown RI 02852. Speaking of Engaged Practice, There will be a rally in Providence at the State House at 11 AM on June 30 to demand that our government not separate children from their families. We can use the google group to organize a Sangha presence for those of you who are interested. There is a new Sangha forming in Newport. The first gathering will be on July 9 at 6:30 at St. Paul's Methodist Church. This is a wonderful opportunity for those on the other side of the bay! I would like to ask you to continue to hold me in your prayers. I am on the second chemo...so it has not started to do it's thing yet, but I have been able to tolerate it so that I can complete the first round over the next 2 weeks. Thank you for all of you love and care. If I have harmed any one in any way, either knowingly or unknowingly through my own confusions, I ask their forgiveness. If any one has harmed me in any way, either knowingly or unknowingly through their own confusions, I forgive them. And if there is a situation I am not yet ready to forgive, I forgive myself for that. For all the ways that I harm myself, negate, doubt, belittle myself, judge or be unkind to myself, through my own confusions, I forgive myself. I hope you are well and enjoying these beautiful June days and for those of you who are fathers, we want to thank you for taking on such an important practice and we hope you have a lovely day. This is just a reminder that we will be gathering at our home on Sunday at 6 PM. We will enjoy sitting/walking and sitting meditation, I will offer a talk and we will share the Dharma. I hope that you will be able to be with us. GOOD NEWS! Twenty Six Order members received Lamp Transmission at the 21 Day Retreat at Plum Village. Two from the Northeast were Valerie Brown and Bruce Nichols. We are sooooo happy! A new Sangha will be starting up in Newport on July 9 at 6:30PM at St. Paul's Methodist Church. Please save the date and more information will follow. It will be lovely to be able to have the folks on Aquidneck Island have access to a Sangha. I have included information below for those of you who are interested in Engaged Practice. I personally feel that what our country is doing now is beyond partisan politics...it is a matter of human rights. As someone who spent a big part of my life doing crisis intervention counseling with children, it is terrible to imagine the damage that is being done to these children. There are ways that we might help. "Your Parents Are Alive in You - Thích Nhất Hạnh, Inherited Trauma"
"Thay rolls a lotus petal and begins smiling... but we had no idea what would happen next!" and again...paste into youtube to be delighted ...happy father's day...enjoy! Dad joins ‘scared’ daughter during ballet dance to help fight stage fear. and I have found that Slate Magazine has good suggestions for helping. If you have friends out west, a lot of volunteers are needed. I hope you are enjoying this beautiful weekend, forgiving yourself and everyone. I have been looking deeply at the art of forgiveness...it is a powerful step into freedom. We can take a big step to becoming freer tomorrow night as we deepen our practice together at 6PM at the home of the West's. (directions below) We will enjoy sitting/walking (in the garden - weather permitting) sitting meditation and sharing the Dharma. I hope that you are able to join us. CAPE SANGHA RETREAT IS FULL - The Cape retreat filled in one week...even quicker than usual. I am sorry if you wanted to join us, but were too late. They usually maintain a cancellation list - there are always some folks at the last minute. HELP THE SANGHA. Please remember, there will be a meeting on Monday the 25th to look together at ways to take care of and strengthen the Sangha. If you are interested in helping out, whether you can attend the meeting or not, please contact Cindy at westnest5@verizon.net. There is a lovely question and answer session with Thich Nhat Hanh on youtube...you can access it by typing in.... "How to let anger out?" The Blue Cliff monastics are also inviting anyone who would like to, to travel with them to India...information is below. So we have lots and lots of opportunities to deepen our understanding and our practice. I hope you will be able to be with us tomorrow...if not, I hope that you are looking at all of the conditions for happiness that you have in your life...and enjoy every minute. We invite you to join us on a journey through a fascinating and mysterious India – as we walk 'In the Footsteps of the Buddha'. The pilgrimage is an unforgettable opportunity to explore areas that few tourists visit and to see and experience aspects of Indian life that, in many ways, have not changed since the time of the Buddha. We invite you to journey with other practitioners, including monastics from the Plum Village tradition, on a transformative journey that will allow you to touch an ancient culture and civilization, and experience the life of the Buddha through the places he lived and taught. I hope you are well and enjoying this glorious day! This is a reminder that we will be gathering at the Unitarian Universalist Congregation of South County at 27 North Rd. in Peace Dale at 6 PM Sunday evening. We will enjoy sitting meditation, reciting the Five Mindfulness Trainings and sharing the Dharma. I hope that you will be able to be with us. I am not able to do all that I have been doing over the years, so I am very grateful that a small group of Sangha members have been looking at ways to take care of and strengthen the Sangha. They are inviting all who might be interested in helping out to attend a gathering on Monday evening, June 25th at the home of the Buffums from 7-8:30PM. If you enjoy the Sangha and feel that you have benefited from the practice, it would be wonderful if you would be willing to participate in this care taking effort. This will not be a huge commitment of time. There will perhaps be three gatherings a year. If you are interested, please contact Cindy at westnest5@verizon.net. Also, if you would like to participate, but cannot make the 25th gathering, please contact Cindy and the group will keep you in the loop. Thank you in advance to all of you who might be willing to help. If you need to have your spirits lifted, and become more optimistic about the future.... go to youtube and type in "Heal the World, Child Prodigies" Enjoy!! I hope we can be together tomorrow evening. ...until then enjoy every moment....I am presently enjoying the ratcheting songs of the wood frogs. I hope that this finds you enjoying this glorious morning and being peace. On this Memorial Day weekend, I can think of no better way to honor those who have died in so many wars than to cultivate our capacity to be peace and to resolve conflicts peacefully. We can do just that tomorrow evening when we gather at our home at 725 Matunuck School House Rd in Wakefield at 6 PM. We will enjoy sitting / walking (in the garden -weather permitting / sitting meditation, I will offer some practices for being peace and we will share the Dharma. I hope that you will be able to be with us. There is a delightful Dharma talk by Thay that you can access on youtube by typing in ... "Why do people have different Karma"? Enjoy! I hope you will be able to be with us tomorrow. Until then, enjoy this lovely day, remember to breathe and be peace. The rock sculptor is back at Narragansett...Summer cannot be far away! I hope you are enjoying these mercurial days of May and that you are giving yourself the time to stop to create the spaciousness where creativity exists. This is just a reminder that this coming Sunday the Sangha will meet at the West home (directions below) at 6 PM. There will be sitting/walking (in their beautiful garden - weather permitting) sitting meditation. We will continue to share Thay's writings on the Miracle of Mindfulness and share the Dharma. I hope you will be able to be there. Next Sunday the 27th we will be meeting at our home. There are talks available from the recent Order member retreat at Blue Cliff Monastery. One that you might be interested in is one given on inclusivity by Sr. The Nghiem and Valerie Brown. Just go to youtube and type in "OI retreat inclusivity"
There is also a wonderfully inspiring story about a village in India where one person has made a big difference by inspiring others...go to youtube and type in "This Village plants 111 trees whenever a girl is born"...Enjoy!!! Until we meet, I hope you fostering the spaciousness to allow your imagination to offer you a preview of life's coming attractions! Dear Friends, I hope you are all well and happy and celebrating mothers...if you are one, have one or know some that are wonderful. I am feeling gratitude for mothers everywhere - for stepping into that unknown and awesome responsibility and doing their best....and to my own mother for giving me life and the opportunity to experience all of the wonders of life. So, a deep bow to all of you mothers out there! This is a reminder that we will be gathering tomorrow evening at our home. The Wests have been kind enought to trade weeks with us - so the gathering will be at their home next Sunday. But tomorrow we will be at 725 Matunuck School House Rd at 6 PM. We will enjoy sitting/walking/sitting meditation, I will offer a talk and we will share the Dharma. I hope that you will be able to be with us. Many of us have found that our practice has been a huge help in healing our relationships with our parents. For those of you who are new to our practice, you might like to read Thich Nhat Hanh's book "Reconciliation". It is a wonderful resource for practices for conflict resolution and healing the past in the present moment. I am also including my annual mailing of the history of Mother's Day. It began as a Proclamation by Julia Ward Howe as a call to mothers to resist wars. I find it a beautiful reminder and, sadly, it's every bit as relevant now as in 1870. We still need to realize her vision. I hope you have a wonderful day and find many causes and conditions for which to be grateful. The First Mother's Day proclaimed in 1870 by Julia Ward Howe was a passionate demand for disarmament and peace. Biography of Julia Ward Howe US feminist, reformer, and writer Julia Ward Howe was born May 27, 1819 in New York City. She married Samuel Gridley Howe of Boston, a physician and social reformer. After the Civil War, she campaigned for women rights, anti-slavery, equality, and for world peace. She published several volumes of poetry, travel books, and a play. She became the first woman to be elected to the American Academy of Arts and Letters in 1908. She was an ardent antislavery activist who wrote the Battle Hymn of the Republic in 1862, sung to the tune of John Brown's Body. She wrote a biography in 1883 of Margaret Fuller, who was a prominent literary figure and a member of Ralph Waldo Emerson's Transcendentalists. She died in 1910. Our new neighbors...5 little boys! I hope you are all well and enjoying every single miracle of this springtime. Baby lambs being one I particularly love! The other is hummingbirds and they have returned. I saw them hovering around where we had our feeder last year...mixed up some food and within an hour they were feeding. I am amazed that out of all the places in the world, they find their way back to our feeder! How do they do it! Another wonderful mystery. This is just a reminder that we will be meeting at the Unitarian Church in Peace Dale tomorrow evening at 6 PM. We will enjoy sitting meditation, continue to learn from Thay's book Creating True Peace, recite the Five Trainings and share the Dharma. I hope you will be able to be with us. It will be wonderful to be able to be together again. I could watch these tiny goats play all day! Again thank you for all of your wonderful cards and wishes. I am very moved and my heart is very full. Please continue to hold Richard and me in your prayers.